Abbas spokesperson accuses US ambassador of providing 'pretext for violence', suggests ambassador represents Israel, rather than US. A spokesperson for Palestinian Authority chairman Mahmoud Abbas accused the US Ambassador to Israel of having divided loyalties, and blamed the ambassador for the recent spate of violence in the region. Nabil Abu Rudeinah, a spokesperson for Abbas, said Wednesday that US Ambassador David Friedman had provided terrorists with “pretexts for… acts of violence”, and was “making the situation more tense”, the PA’s Wafa media outlet reported on Thursday. 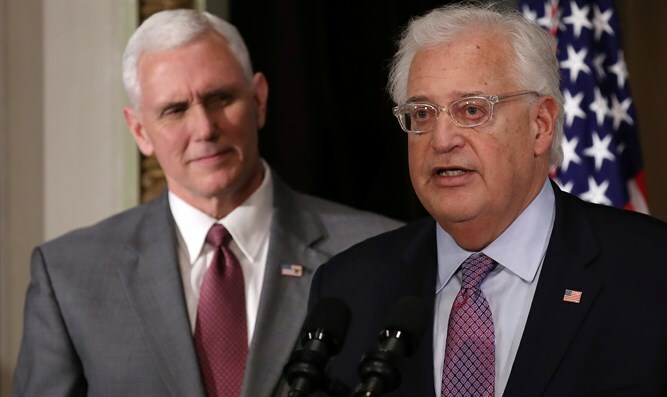 Earlier this week, Ambassador Friedman slammed Palestinian Arab leaders following a deadly terror attack in the city of Ariel Monday, noting that many had “praised the killer”. “20 years ago I gave an ambulance to Har Bracha hoping it would be used to deliver healthy babies. Instead, a man from Har Bracha was just murdered by a terrorist, leaving behind a wife and four children. Palestinian ‘leaders’ have praised the killer. Praying for the BenGal family,” the Ambassador tweeted. The Palestinian Authority declined to issue any condemnation of the attack at the time, while terror groups including Hamas and Islamic Jihad praised the murder as a “heroic act”. In response, on Wednesday Abbas’ spokesman claimed Friedman had given terrorists the “pretext” for their attacks. Abu Rudeinah also accused Friedman of sabotaging the US-PA relationship. The PA spokesman also invoked the classic anti-Semitic canard of dual loyalty, suggesting the ambassador was representing Israel, rather than the Trump administration.